Jerusalem, HaKotel: The progressive Jewish community both in Israel and abroad is celebrating the recent ruling allowing women to pray at the Western Wall while wearing Talit, wrapping Tefillin, and holding the Torah. Yet while many in the Progressive World are applauding these steps, other voices feel that the struggle is not over. “We demand full equality, and we will only have this when we have the right to perform all of the activities that are traditionally performed by men.” noted Rabbi Miriam G. as she began furiously daytrading an IPO on her I-Phone during Silent Amidah. 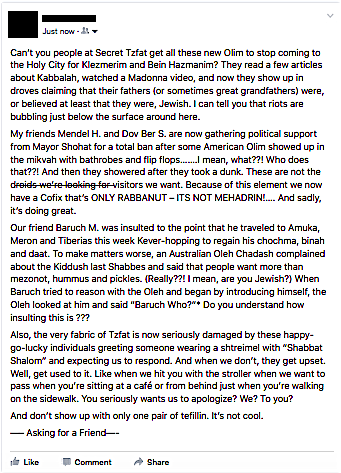 “It is time to break down these artificial constructs and free ourselves.” she said while walking around telling total strangers that she didn’t like the way they wrapped their Tefillin. The Daily Freier also had the opportunity to hear from activist Tirza W. “This is not just a victory for Women of the Wall, this is a victory for inclusion and equality.” she observed, shortly before falling into a coma-like sleep as the Rabbi began her Divrei Torah on this week’s portion. At this point the Daily Freier left the premises, as the women ignored us to angrily debate the referee’s calls in yesterday’s game.